Drugs, as Nancy Reagan told us, are something you’re supposed to say No to. But there are two big problems with that directive and with the longer history of prohibition and inhibition that it stems from. One is practical: People really like to do drugs. As David T. Courtwright’s Forces of Habit (2002) demonstrates, every culture on earth has at least one preferred intoxicant, and most have several. The other problem is more philosophical: What is a drug, anyway? It is easy to name individual drugs; it is far harder to explain why some chemicals are permitted in certain contexts while others remain forbidden. Then try to succinctly articulate what “being high” means or where the desire to get high comes from in the first place, and soon you’re down a rabbit hole deeper than any hangover, where questions proliferate like mushrooms. 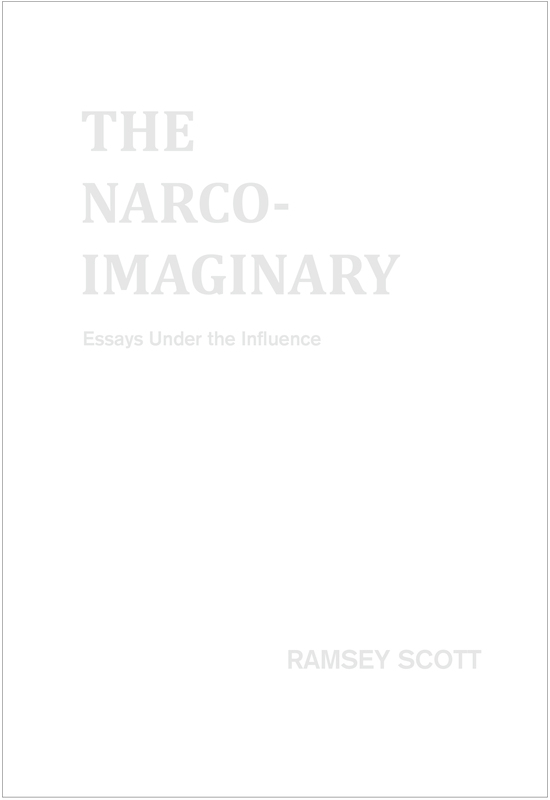 But along has come Ramsey Scott’s provocative, strange new collection of essays, The Narco-Imaginary, which links material history to philosophical speculation in ways that have wide-ranging implications for cultural and literary criticism. Scott’s grounding argument is that drugs are heavily determined in disciplinary, institutional, and discursive terms. Attempting to describe the “narco-imaginary” means venturing into territory long disputed by multiple stakeholders. Biochemists, poets, painters, neurologists, farmers, publicists, economists, musicians, psychiatrists, pharmaceutical companies, private-equity traders, sci-fi novelists, literary theorists, the police—everyone has a cut of the action. Writing this book thus meant dodging rhetorical and conceptual boundaries: “You find yourself struggling against a warren of conventions and institutions—the partitioning of territory, at every conceivable level—not only the miserable American legacy of the division of lands, regions, and neighborhoods, but the regulation of discourse itself—historical and literary, popular and academic.” It is difficult to say what genre The Narco-Imaginary inhabits. Perhaps it is best to observe that, like narcotic substances, Scott’s prose defies easy categorization. By turns lyrical and acerbic, encyclopedic and dilettantish, critical and impressionistic, his essays set out like Montaigne’s, without a definite end. “Language is the universal inebriant,” he declares at the end of the Prologue. “Narcotic” derives from a Greek verb that means to deaden or benumb, which first shows up in Hippocrates’s medical writings. Meanwhile, when “drug” migrated from French into Middle English in the fifteenth century, one of its meanings was a person or thing of little value. (“On drugs” doesn’t enter the language as a derogatory colloquialism until the mid-1930s, affirms the OED.) Psychoactive substances—all but the mildest—still carry pejorative connotations to one degree or another. The long, disastrous American War on Drugs has only deepened these in public discourse, whereby even dabblers (to say nothing of outright addicts) are untrustworthy at best and dangerous at worst. The Narco-Imaginary contests this facile assumption. Without denying that addiction is bad or that drugs can be paralyzing—Scott mentions his struggle with Adderall as a writing aid—it underscores the fruits of narcotic experience as a whole phenomenological orientation. What matters is the cultural material culled by artists and writers, believers and travelers, philosophers and scientists, who have experimented in various ways with drugs and tried to describe the results in their home discourses. As the comedian Bill Hicks said, if you don’t like the idea of people using drugs, you should go home and throw out all of your records. It is worth remembering that the desire to get high intersects with and sometimes even produces high art.